"I don't think we need to rebuild. "Rebuilding is for some of those teams who haven't won. We need to fill in some of the areas where we have not had good performances." Fast forward to December 12, 2007. What a difference five months makes. New manager, new GM, and now a shiny new $13/yr shortstop. Indeed in five months time, the Astros have gone from the possible veteran-dumper to the trendy, new veteran-dumpee, trading five spare parts of varying age, talent level, potential and baseball IQ (I'm lookin' at you, Albers) for one slightly aging, stud middle infielder. 1. The nucleus isn't getting any younger. The Astros have $40M of their payroll committed to their core untouchables in Lance Berkman, Roy Oswalt, and Carlos Lee. These three are all under contract for 3-5 more years. Berkman and Lee will be turn 32 before or during next season; Oswalt will turn 31 in August and has made it clear he intends to hang it up after this contract is up. To choose the route of a lengthy rebuilding process while paying these three all of that money and watching the window close on their respective primes would be foolish. It's a core group (along with Hunter Pence) that can hang with the top four of practically any team in the National League. Add to that the fact the National League Central is baseball's most imminently winnable division, and it becomes clear that the time is now to try and scratch something together. 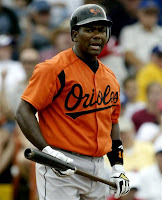 Miguel Tejada takes that core group from "satisfyingly impressive" to "potentially deadly". 2. Rebuild with what? By all accounts (expert and not so expert), the Astros farm system is in a drastic state of disrepair. And we're not just talking about it needing a paint job and some landscaping; no, if the minor leagues were a trailer park, then the tornado came through and leveled the Astros whole rig. In other words, the Astros farm system is going to be at least a couple years of rebuilding itself away from being able to help the big club sustain any serious "rebuilding" effort. So if that's the case, then we may as well have some fun, guzzle some $8 beers, and try to win now in 2008 and 2009 at the major league level, while Ed Wade quietly goes about the business of cleaning up the carnage that Hurricane Purpura left in its ample wake. If Drayton is truly in the "win now" mode he appears to be in, then I still think the Astros have at least one fairly prominent signing left in them (Josh Fogg? Livan Hernandez?). That said, even with another signing or two, the Harvey's Wallbangers (salut '82 Brewers) approach of lining up a murderer's row and trying to outslug teams makes some sense, especially when you consider the cozy confines that the Astros play in 81 games out of the season. People will give Drayton McLane props for stepping up and paying Tejada $13M/yr the next two seasons, but he should very easily have that paid off by July with the additional concessions sold at all of the 4 hour and 45 minute, 15-12 games in which the Astros are going to be invovled. Myself, I will gladly scarf down a few more $10 helmet sundaes and $8.50 cheeseburgers if it means getting to the postseason. Really, it's the least I can do. Agreed. We can't hope for Backe and Woody to account for many wins this season. A good #2 starter is what is needed most now. I salute uncle McLane, Wade and of course the Godfather, Tal Smith for getting this deal done. Now finish what you started and go get a pitcher and quick.